Can men and women ever really be friends? Lucy and Max have been best friends forever. 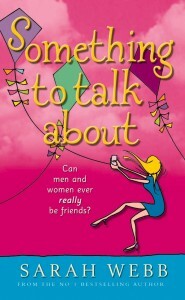 Lucy, a bored beautician with a Jamie Oliver obsession, is determined to find kite-maker, Max a girlfriend - someone who will meet up to her own high standards. So, in the name of 'true love' and with the help ofJamie's The Naked Chef, Lucy decides to hold a Meet Max dinner to find Max the right woman, in the form of her beautiful friend, Jenny. Food, wine and romance go hand in hand after all. At first everything goes well, and it seems that food, wine and romance do go hand in hand after all. But soon easy-going Max is running scared of man-eater, Jenny. He decides he'd much prefer to be out flying his power kites than falling into the dating pit again. But fate works in mysterious ways and sometimes even kite-makers get their strings tangled. And when Max does meet someone special and 'forgets' to tell Lucy there are far-reaching consequences. I call this my 'Harry Met Sally' book as it's about two friends, Lucy and Max. Can men and women ever really be friends? You'll have to read their story to find out! I think we made the right choice - what do you think?